Boulder, Colorado — Babolat, leading manufacturer of tennis racquets, officially welcomed tennis star Kim Clijsters to New York City for the U.S. Open today. 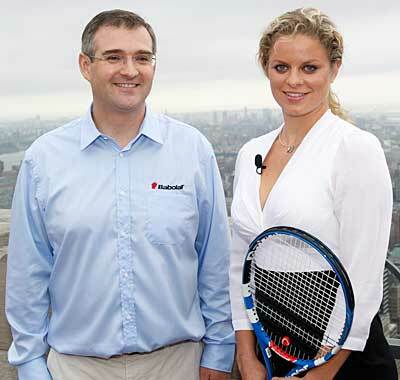 Just days before her first appearance in a major since 2007, Clijsters posed for pictures with Eric Babolat, president and CEO of Babolat, at the iconic Top of the Rock Observation Deck at Rockefeller Center in New York City. With the picturesque Manhattan skyline as the backdrop, Eric Babolat personally welcomed Clijsters back to professional tennis. “We have been working together since 1999 when Kim was only 16 years-old. She’s a player with outstanding athletic and personal qualities. Our relationship is based on mutual trust. We are very glad to be with her for her comeback on the Tour,” says Eric Babolat. This Monday, Kim Clijsters will make her first appearance in a major since pausing her professional career to devote time to her family. Clijsters is returning with her familiar Babolat Pure Drive racquet in hand, strung with Babolat’s VS Natural Gut. The new Pure Drive racquet brings a performance boost to the game. Babolat was behind Clijsters from her first victory on the Junior tour through her career to World #1 in 2003. Inventor of tennis racquet strings 134 years ago in Lyon, France, Babolat is among the world leaders in tennis racquets. Today, the brand includes a complete tennis offering for competition and club players alike: racquets, strings, shoes, bags, and accessories. Babolat equips 20% of the top 100 players in the ATP and WTA including Rafael Nadal (Spain, #3 ATP), Andy Roddick (USA, #5 ATP) and Dinara Safina (RUSSIA, #1 WTA). To find out where Babolat products are sold, log on to babolat.com or call (877) 316-9435.